Hey friends!! I have another layout to share for The Cut Shoppe!! 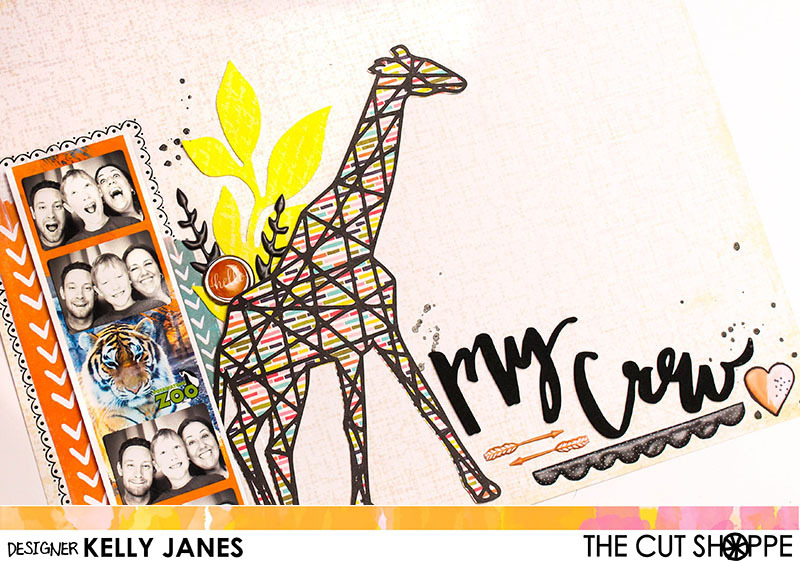 I used a lot of different products from my stash to create this layout using the Hul-La-Ba-Zoo Cut File! How awesome is this cut file?! So perfect for zoo photos! 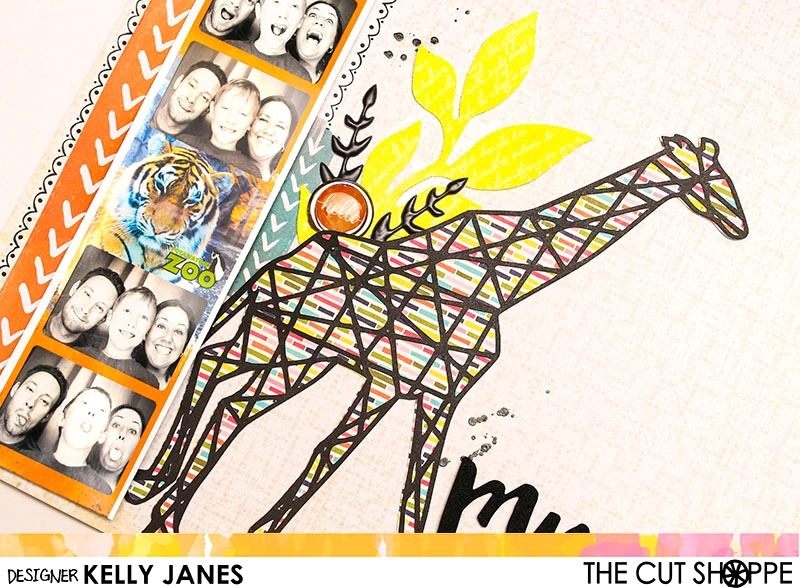 I loved how this photo booth strip of photos turned out from a recent trip to the zoo and couldn’t wait to scrap it! I cut the giraffe cut file using a pattern paper from the Jillibean Soup Healthy Hello Collection and CTMH Black Cardstock. I positioned the giraffe towards the center of the 12×12 paper. I added the photo strip to the left of the cut file and layered a couple strips of paper from the Amy Tangerine Rise & Shine Collection behind the photo. I also added a black scallop rub-on border around the photo just to help draw your eye to the photo. 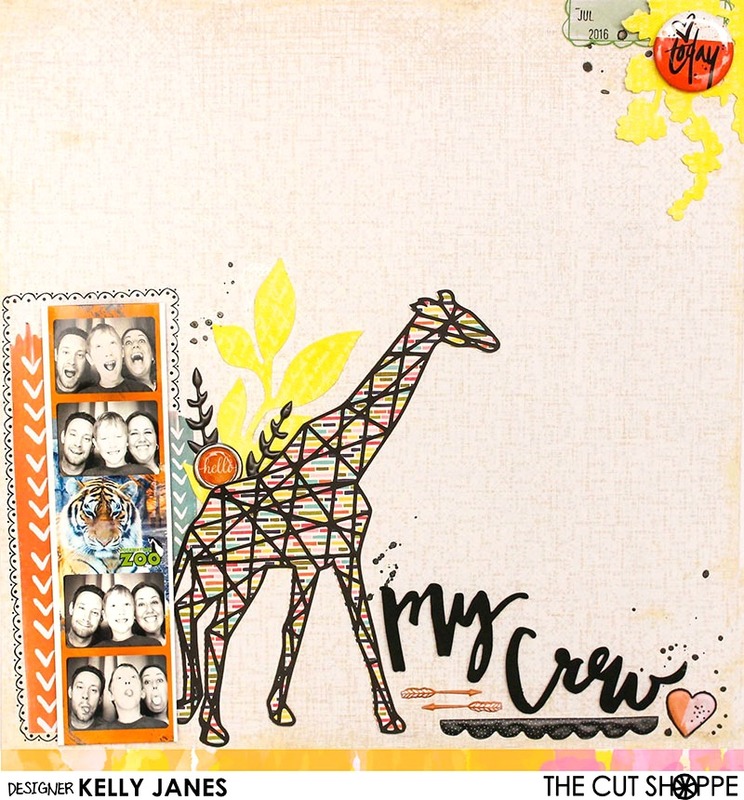 I felt like that there was too much empty space between the giraffe and the photo so I added a Prima Resist Canvas floral sprayed with Shimmerz No Yoking Coloringz, a couple black puffy stickers from Hip Kit Club, and a clip from the Shimelle Starshine Collection. Next I moved on to the title which is from a pack of Dear Lizzy Thickers. I positioned a few more of the Hip Kit Club stickers around the title, including a couple arrows, a black scallop, and a heart. Once I had all that down I realized that they top right corner was looking a little bare so I created a cluster to fill in the area. I fussy cut a label from one of the Amy Tangerine Rise and Shine pattern papers. I added another Prima Resist Canvas floral misted in the same Shimmerz spray and a flair button from My Mind’s Eye. I added Black Heidi Swapp Color Shine in a few areas of the layout and it was complete!! I also created a video showing you the process of how this layout came together!! There’s also a bonus Cricut Design Space tutorial! Thanks for stopping by and don’t forget to check out The Cut Shoppe Etsy Store! !